Let’s face it. Summer heat is here. We can either stay in the air conditioning, or we can head out and find some other ways to cool off when it gets too hot outside. What better way to beat the heat than to find some water fun ways to cool off! 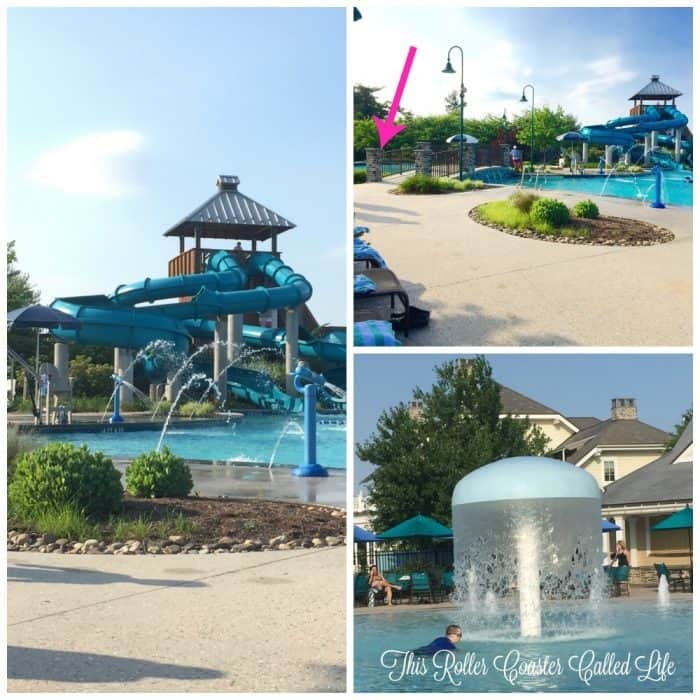 Here are my top 3 places to beat the heat in Hershey PA! Swimming, anyone? FTC disclosure – Please keep in mind that as part of the 2017 Sweetest Moms group, I do received some experiences free of charge in order to share my family’s experiences with you. All opinions are my own. 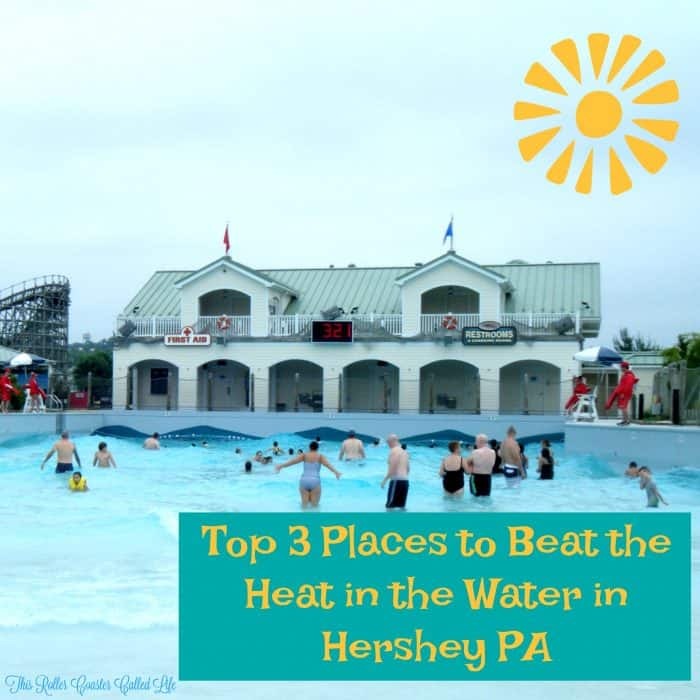 Let’s take a look at three places to cool off in the water in Hershey, PA! I’ll start with Hersheypark. Hersheypark has its own waterpark within the park. This waterpark is called the Boardwalk. Access to the Boardwalk is included in your admission to Hersheypark, so if you want to play in the water during your trip to Hersheypark, make sure to pack your swimming suit! Swimwear is only allowed within the confines of the Boardwalk, but Hersheypark does a good job of providing ways to allow guests to combine playing in the Boardwalk and still being able to enjoy the coaster fun in the main part of the park. There are lots of lockers for rent to store your things, and restrooms with changing facilities available. Just opposite one of the entrances to the Boardwalk, there is even a giant dryer that people can pay to stand in to dry off. I’ve never tried it, though. Another option is the cabanas at the Boardwalk. 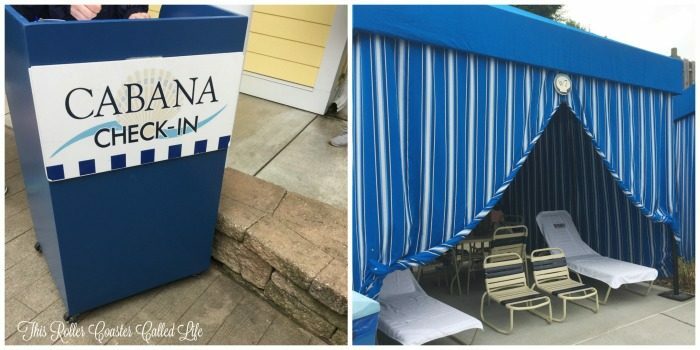 These are an extra charge, and you can read about our experience with the cabanas here. Whether you use the public facilities or rent a cabana, there are a lot of fun things to do at the Boardwalk, so let’s take a look at some of the water fun things there. What would a waterpark be without a wave pool? The wave pool is called “The Shore” and has a depth of zero to six feet. The Shore seems to be a very popular draw during the summer months. I know my kids enjoy bobbing in the waves without the fear of stinging jellyfish! Up next, we have the waterslides that make up the Coastline Plunge. From the curvy slides to the “Whirlwind” with its yellow and blue stripes that sends round and round, there are plenty of slides to choose from. I think the hub of the Boardwalk is really the East Coast Waterworks! It is loads of fun for a wide variety of ages/height ranges and is definitely a fun way to stay cool by getting wet. Just watch out for the water buckets to get full… That is a HUGE avalanche of water! There are lots of fun ways to get wet, even for the little ones! In the photos above and on the left are pictures of the Shoreline Sprayground and the Sandcastle Cove. Don’t they look like fun places for the little ones to splash around in? There’s also the Waverider and the Intercoastal Waterway. The Intercoastal Waterway is one of my favorites! I love to nab an inner tube and float along while watching my son make sure Don is hit directly in the streams of water that are found along the waterway. What do you do when you work up an appetite while swimming all day? 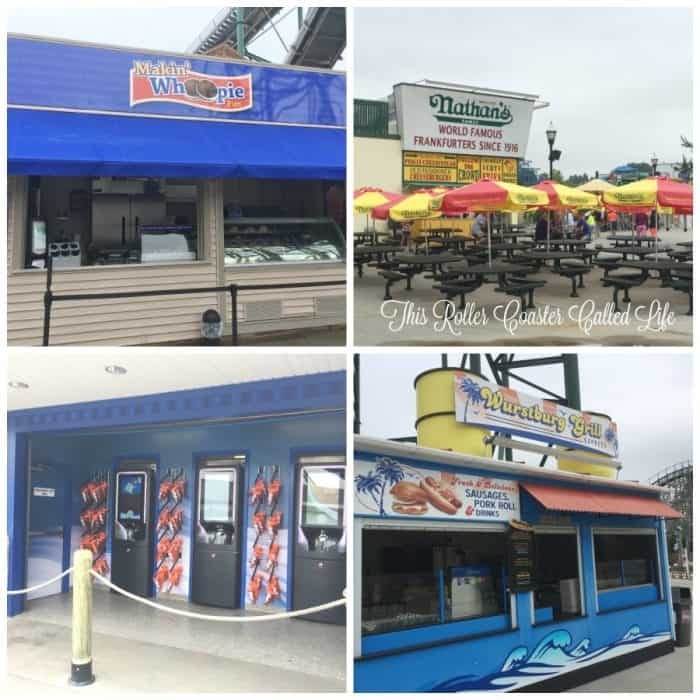 There are a few places to eat within the Boardwalk. There’s also a Dunkin Donuts and Rita’s Italian Ice. 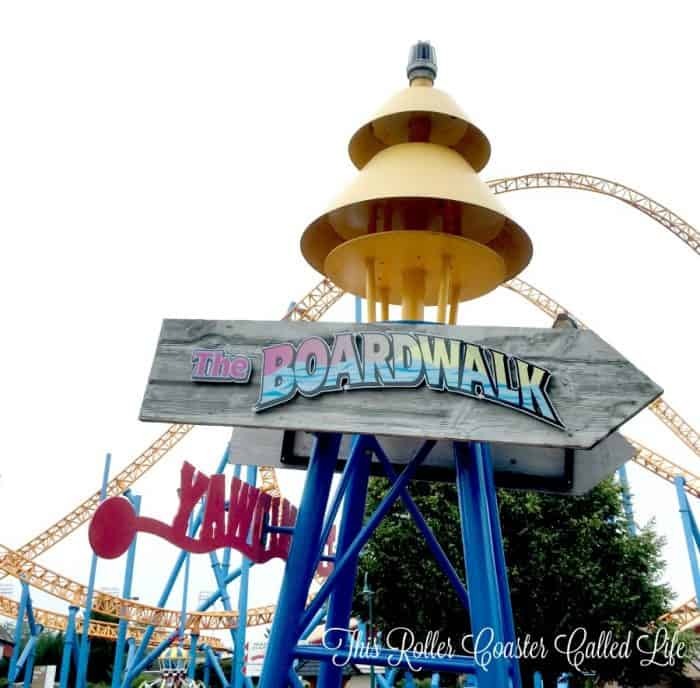 We have a lot of fun at the Boardwalk, and it is truly a nice change from just riding the roller coasters and other dry rides at Hersheypark. 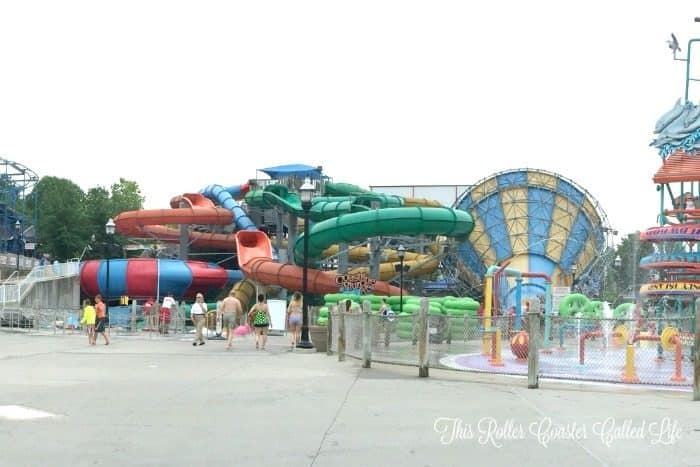 Don’t get me wrong… We love the rides at Hersheypark, but it is nice to break it up with a little swimming, sliding, and floating during the summer months! 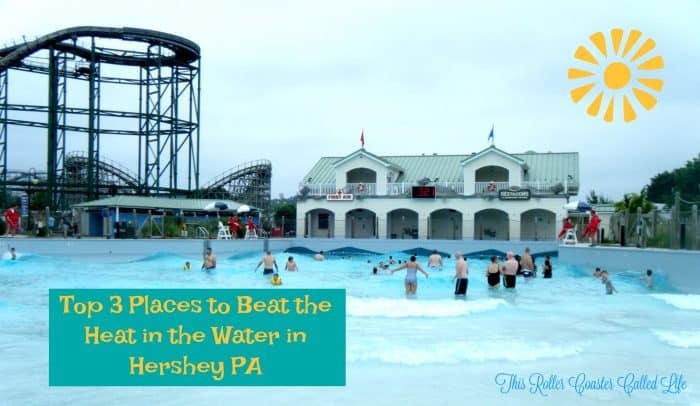 The next two places on my list are swimming locations at the resorts of Hersheypark. 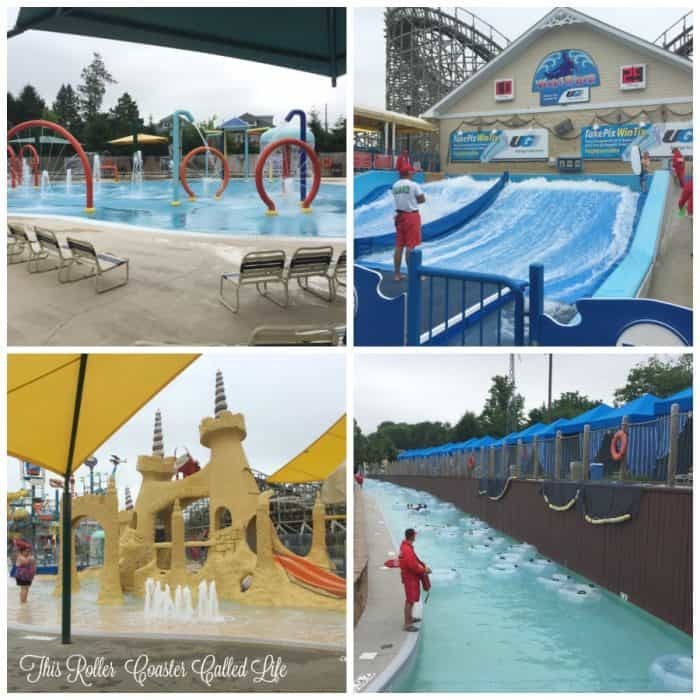 You have to be staying at these properties to enjoy their swimming fun; however, if you have to stay in Hershey, PA, I can’t think of any place better to stay than to stay at a Hersheypark resort! 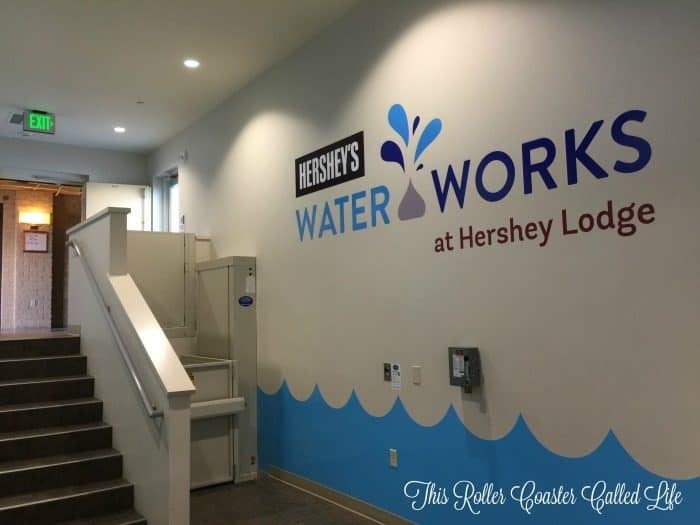 First up is Hershey’s Water Works at Hershey Lodge. 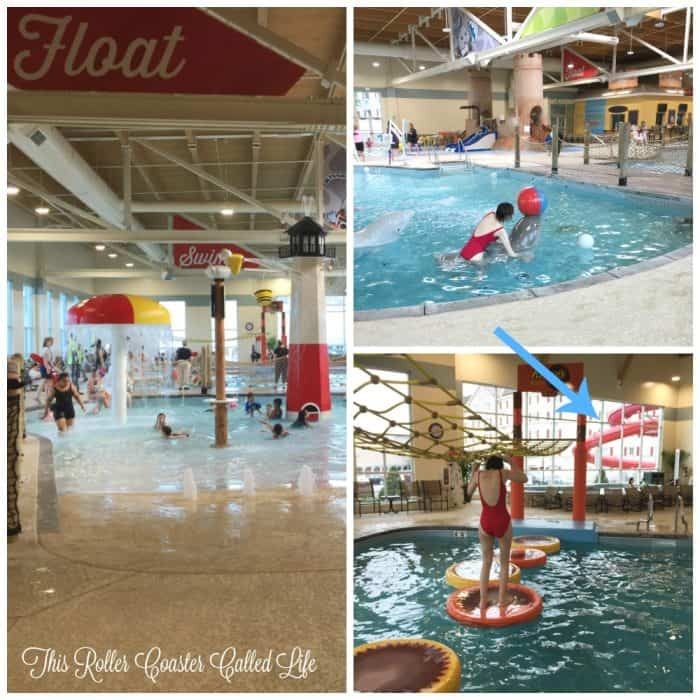 This indoor water playground opened in 2016 provides a fun place to play in the water out of the sun’s rays during the summer but also a refreshing place to swim in the warmth during the winter. It’s the best of both worlds without the need for sunscreen! Hershey’s Water Works has a small slide and splash zone for the younger set, along with a zero entry pool that is shallow. There is also a deeper pool that includes Reese’s Water Walk, as well as, a couple of basketball hoops. I know my kids enjoy shooting hoops when they go to Hershey’s Water Works. Let’s not forget Twizzlers Twists! Twizzlers Twists are the red waterslides that go outside the building and back in again. You can see them at the blue arrow in the photo above. Hershey’s Water Works also includes a game room and a multi-purpose room that has unique tables, table games, and a lego table (Marvel Boy’s favorite). There is also Cocoa Cabana for when it is time for a snack or a drink. I know it doesn’t take long before my son is asking for a snack, and they do have quite a few choices for kids. Don’t forget… There is also an outdoor swimming pool and splash play area, too. Now, let’s travel across town (closer to Hersheypark) to The Hotel Hershey. I have stayed at The Hotel Hershey before; however, it was not during the summer season. In June, we had the opportunity to stay at The Hotel Hershey during swimming season. We decided to spend the afternoon at the pool complex. It was a relaxing place with lots of loungers in the shade when we went. There were servers who came around asking if I wanted to order a drink or something. We had recently eaten lunch, so we didn’t try anything. Because so many people were over at Hersheypark having fun, we were able to enjoy some fun in a fairly empty pool on the particular afternoon that we were there. As you can see, there are a couple of nicely sized water slides at one end of the large pool. There is also a kid-pleasing spray deck at the edge of the zero-entry family pool. If you look at the collage above, there is an arrow pointing toward the infinity edge adult pool and hot tub area. It’s nice that The Hotel Hershey offers a separate area for adults and families. There are also cabanas for rent. It looks like a nice option, but they are an additional charge. If you plan on spending the whole day at the pool, it might be a fun option. However, I didn’t look into how much they cost. Don’t forget… The Hotel Hershey also has an indoor pool. There are plenty of ways to play in the water in Hershey, PA! Whether you love a plussed-up hotel pool complex for breaks from the parks, you enjoy a swimming break to cool off from riding roller coasters, or you want to spend the day at The Boardwalk, Hershey, PA has you covered! I love the boardwalk for all the water slides and the wave pool for my grandson. 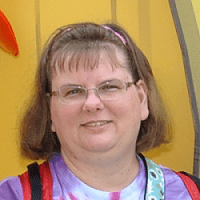 I have not been to Hershey Park in 10 years! It is time to plan a trip to head back to the sweetest place on earth. I’ve always wanted to go here,you just gave me even more incentive to go! Sure looks like lots of fun! I would love to try the Eastcoast Waterworks! 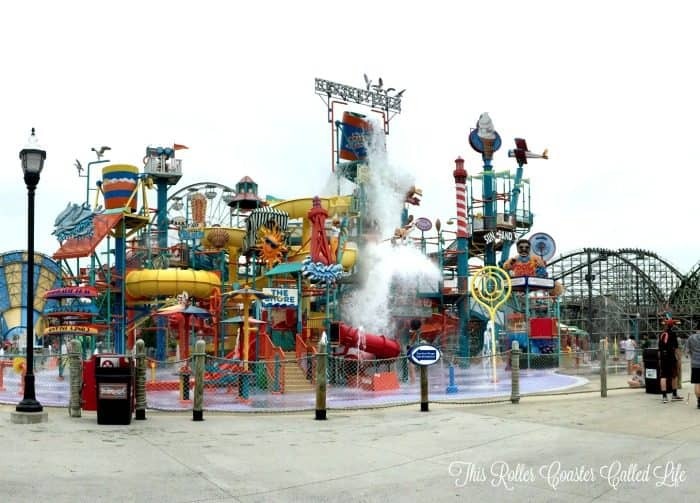 We love water parks and it would be so much fun to go see Hershey park in the summer! It’s been unbearably hot in NC. I wish we had a waterpark in my home town, it’s about an hour 1/2 away. We’re going next month! Can’t wait to check out the wave pool! Thanks for the heads up! We always visit Hershey Park at Christmas. This waterpark looks like so much fun. Will have to make a trip up there during the summer months now. Thanks for all the good info. It all looks very cooling! Thanks for the post! I look forward to visiting Hershey, PA in the upcoming future. Thanks for sharing. This really looks like a lot of fun. My grandchildren would love it!!! !